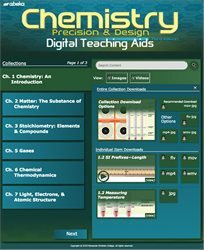 Enhance your child’s understanding of complex science concepts with the Chemistry: Precision and Design Digital Teaching Aids. These 175 images and 73 videos correspond with the material being taught in the student textbook, and display intricate chemistry concepts that are normally unseen to the naked eye. With charts, graphs, and detailed videos, your child will be able to explain the chemistry behind photosynthesis, diffusion, the molecular structure, and more with these Digital Teaching Aids. Digital Teaching Aids are broadly compatible with your favorite presentation software that supports .mov, .mp4, and .flv file formats, whether you are running the software on a computer, tablet, or other mobile device; and can be projected using a smart board, screen, television, or can be printed on a poster-sized chart for display.